Review: Now THIS is a zombie book. These are your standard, classic zombies. Dead rising to live again. An infectious bite. Slow, shuffling, moaning. Fantastic. That isn't to say none of this is original. Maberry made a world that is both classic and unique. Quite a feat. And he had a great mind for detail. For example, he mentions that zombies tend to gravitate towards downward sloping places, since shuffling is difficult for them. Therefore, a mountain would be a good place to get away from them. I'd never thought of that, but it totally makes sense! This book is action packed, heart wrenching, and thrilling. I loved every last page. There is very mild profanity, but it didn't bother me. And there's a lot of gore and grossness (as is the want of zombie books), but that didn't bother me either. It rarely does. If you like Carrie Ryan's The Forest of Hands and Teeth then you'll probably like this one. And I think this'd be a great one for teenage boys. Very kicka. Now I've read all of the zombie books that I know of. Are there more out there? I can't get enough zoms! Oh I lurve me some Carrie Ryan...I'm going to have to read this. Thanks for the recommend, TBR added now. Zombies for the win:) Thanks for recommending, this is so going on my TBR pile. I can't remember if you have read Feed by Mira Grant, but it's my favorite zombie book so far...check it out!! Thanks for that wonderful review! 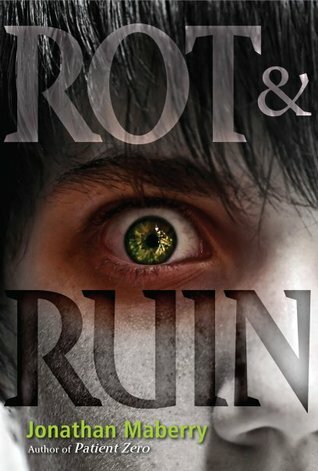 So glad you enjoyed ROT & RUIN. I just finished writing the second book, DUST & DECAY (due out next August), and just sold books 3 and 4. I really WANT to read FEED, but I don't want to buy it 'cause of the profanity, and my library doesn't have it. But I'm working on it. I'm excited for DUST & DECAY! This cover is definitely icky-creepy. I hadn't actually known what the story was about before. Have you read The Monstrumologist? It seems like someone who liked that book would get into Rot and Ruin and vice/versa.